Minor League Baseball is a completely different experience than seeing a game in an MLB stadium. While a trip to a big-league park is about seeing the best players in the world performing in venues tailored to their cities, Minor League Baseball is more about pounding $1 beers on a Thursday night and seeing how a far a giant cow can launch a hot dog, while also getting a really cheap, really close seat to a game. So, with that in mind, determining what makes a minor-league stadium great are some different criteria. It&apos;s about how well that stadium entertains you, with views of the Utah mountains, 60ft scoreboards, or hamburgers sandwiched between deep-dish pizzas. And whether they&apos;re in big cities like Charlotte or small cities like Missoula, minor-league parks all have a character that sets them apart. And across this great nation, here are the top 15. Editor&apos;s Note: We did not include any ballparks that double as spring training facilities, as those are parks designed for MLB spring training, then also used for minor-league ball. 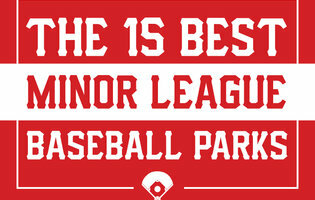 But check out our rundown of the best stadiums in the Grapefruit League and Cactus League. They say the best things come to those who wait, which still might be a tough sell to the 2015 Shuckers team that played a 54-game road trip to start that season, due to construction delays on MGM Park. But once the place opened, all that was forgotten. This palace, set a mere two blocks from the beach on Mississippi&apos;s eclectic Gulf Coast, looks out on the Beau Rivage casino and the Gulf of Mexico with one of the best views in the minors. A view made even more delicious by food stands with names like Shuck n&apos; Cluck that serve shrimp, oysters, and other seafood caught that day or shortly before. The seating is elevated well above the field due to storm-surge regulations, but the sightlines this creates are among the most unique in the minors. And if you&apos;re hankering for a little post-game pai gow, Biloxi&apos;s legendary casino row is literally across the street. Coolest feature: The food. The stadium has standard fare, but past that serves up fresh-from-the-Gulf seafood at its concession stands, meaning the stuff you get at the ballgame is typically as good, if not better, than what you get in local restaurants.